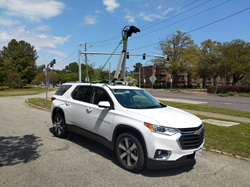 This past spring, Infrasense conducted a multi-faceted non-destructive survey and report for the Granby Street Bridge in Norfolk, Virginia. The project provided the client with a comprehensive set of condition results to facilitate planning bridge rehab and maintenance efforts. More visually intriguing than the quantitative table however, was the bird’s eye view condition map, filled with every detected distress in the bridge, with lane lines, piers, and abutments for reference. Infrasense mobilized from Boston to Virginia to survey Norfolk’s 64,000 square foot Granby Street Bridge. The GPR survey was done in March, and the IR survey was done in April, when the weather conditions were sufficient for revealing subsurface delaminations. The GPR survey was performed at normal driving speed, and IR was done at a rolling 30 mph with the help of safety vehicles. The GPR data collection system included a pair of 1 GHz horn antennas and a SIR 30 control unit, both manufactured by GSSI in the United States. The infrared survey was performed using a FLIR camera mounted on top of the survey vehicle along with a visual feed for reference of surface features. The final report included a quantitative table of rebar level deterioration, rebar depth, debonding detected by IR, and areas of concrete patching. More visually intriguing than the quantitative table however, was the bird’s eye view condition map, filled with every detected distress in the bridge, with lane lines, piers, and abutments for reference. The GPR bridge deck surveys are carried out according to ASTM D6087-08. The resulting data shows a cross-sectional slice of the bridge deck at various offsets. Each slice includes the top of the deck, top mat of reinforcing steel, and the bottom of the deck. The amplitude of these layers is calculated and then quantities and maps of concrete deterioration and concrete cover are produced. The resulting maps are provided in both PDF and CADD compatible formats. The infrared bridge deck surveys are carried out according to ASTM D4788-03 (2013). The infrared data is reviewed simultaneously with the video data to differentiate delaminated areas from surface features (discoloration, oil stains, sand and rust deposits, etc.) that appear in the infrared, but are unrelated to subsurface conditions. Subsurface delaminations produce a thermal barrier and result in higher surface temperatures as the sun heats up a deck. These higher temperature areas are detected with the infrared camera, and subsequently quantified and mapped.